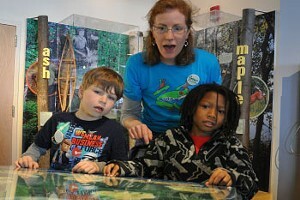 Building a Terrarium | Project | Kids VT - small people, big ideas! Terraria are small, simple and self-sustaining gardens that kids can keep in the house. They require little care, and they're easy and inexpensive to build — especially in the spring and summer months, when it's possible to collect most of the materials outdoors. The best part? These miniature gardens will flourish all year long, even in winter. slow-growing, small plants (4 inches tall or less) collected outdoors or from a local florist. If collecting plants from outside, look for small ferns, tree saplings or small pieces of rotten wood with moss. Be careful not to pick plants that are poisonous or endangered; when in doubt, let them be. Small houseplants with different colors and shapes also work well. Cut the top of a soda bottle off (about of the way down). If using a glass container, skip to the next step. Put small round stones or pebbles in the bottom of your container (about 1 to 2 inches deep). Put soil or compost on top of the stones (about 3 to 4 inches deep). Carefully break apart the roots of your plants and transplant them into the terrarium, making sure all the roots are covered with soil. 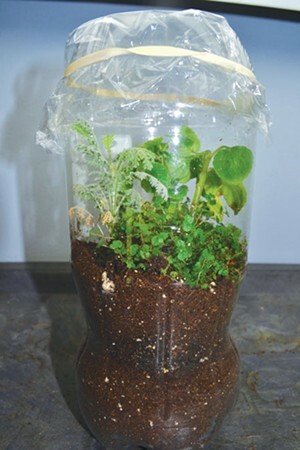 Spray the terrarium with water. Cover the opening of the container with plastic wrap and secure with a rubber band. Place your terrarium out of direct sunlight, preferably near a north-facing window. Direct sunlight will "cook" the plants and eventually cause them to die. Water your terrarium every 7 to 10 days or when the soil starts to look dry. Condensation will form in your terrarium and water droplets will trickle down to the soil, reducing the need to water as often.